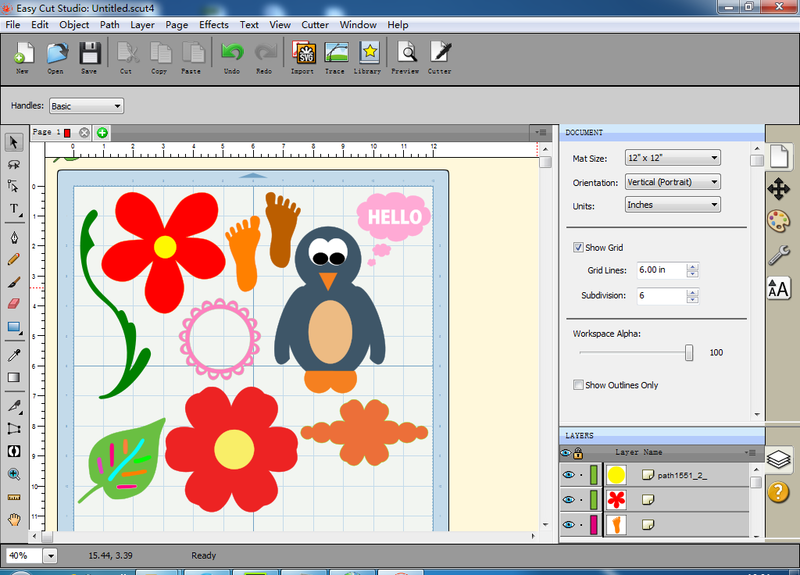 ﻿ Easy Cut Studio - cut any shape, SVG, fonts with vinyl cutter. Cut any Shape or Font with Easy Cut Studio. The software opens up the ability to easily cut virtually any shape you can imagine including TrueType fonts, SVG files using your cutting machine without needing to purchase expensive cartridges. and even draw your own shapes giving you endless possibilities! Go unleash the true power of your electronic cutting machine! Easy Cut Studio allows you to edit existing fonts/svgs, preview SVGs before you import them, import from TTF files directly (no more installing fonts on to your computer!). You can also trace BMP, GIF, JPG, PNG, etc and convert them into vector SVG images for cutting. Easy Cut Studio has a user-contributed SVG/Project gallery built right into the program. You can upload your hard work from within the application and share with everyone. Easy Cut Studio works with various electronic cutting machines/plotters/vinyl cutters. including Vinyl Express, Craftwell eCraft, Foison, GCC, Black Cat Cougar/Lynx, Roland, Silhouette, Roland, Graphtec, Saga, Summa, KNK, GCC, Ioline, PCut, GoldCut, Pazzles Inspiration, USCutter, UKCutter, BossKut Gazelle, SilverBullet, KingCut, Liyu, Redsail, CraftRobo, Craftwell eCraft, i-Craft, Refine, VicSign, Dika, Seiki, Ramtin, Secabo, BlackCat, ZG, Rabbit, Fenta, SignKey, Geokit, PixMax, SignMax, Master Vinyl Cutter and more. and many other vinyl cutters. If you are using Mac OS X, please try the Easy Cut Studio for Mac. WYSIWYG Interface - With Easy Cut Studio, designing shapes is easy with our What You See is What You Get interface. Cut Virtually any Shape - Use your electronic cutting machine to cut any shape you create or import without having to purchase an expensive cartridge. Cut any TrueType or OpenType Font - Use any font you have installed on your windows, or download and install any TrueType font you can find on the internet. Intuitive Editing Tools - Easy Cut Studio™ has simple-to-use tools that allow you to break, split, layer, weld, and join shapes. Convert any Image to SVG - Scan an outline or download an image from the web, then easily convert it into an SVG file compatible with Easy Cut Studio™. Seamlessly weld back together - This option is very useful when editing text, but is also very useful when putting images back together. Shadowing - Shadow all your text and images with a simple click. This feature has been praised by many of the Make the Cut users. Lattice, Cookie Cutter, Boolean Join - Whatever you want to call it, this is an advanced feature that makes for some awesome effects! Work with any SVG File - Import / export any SVG (Scalable Vector Graphic) file you find, or use the Integrated shape gallery! Create custom background shadows from any shape. Scan image directly into the software. Work on Multiple Projects at a Time. Choose From 4 Standard Mat Sizes or custom your own size. Use Any Installed Font or Import TTF/OTF Files. Convert Raster Images to SVG Format. Break/Split/Layer Shapes and Edit Them. Export Shapes to SVG Format or Personal Library. Cut, Copy and Paste Shapes Between Projects. 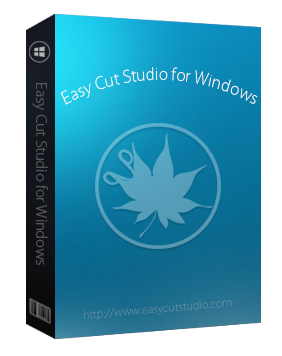 Easy Cut Studio™ now fully compatible with Windows 10. The most amazing sign making and cutting software for Mac that allows you to cut any TrueType font, and any SVG image with your cutting machine. It is a perfect audio tool for your audio production that supports many popular audio formats and features audio cd burning. is a vector-based graphic design software, novel, small and exquisite, quickly create illustrations, documents, manuals, posters, schemas, plans, flow charts, org charts etc.